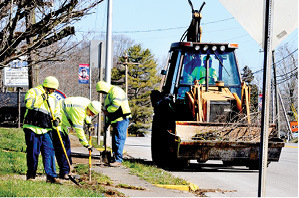 Clinton County News	» Spring sprucing . . .
Spring sprucing . . . Although temperatures were in the mid 50s Friday morning, Albany Road Crew members, Vic Soma, Brooks Ferguson, Chad Asberry and Jeremy Ferguson were out on the streets doing some sidewalk edging. Temperatures will climb this week with highs in the low 70s by Friday and lows in the lower 50s to upper 40s. Chances of rain will close out the weekend with a 40 percent chance on Sunday and highs dropping to the low 50s.